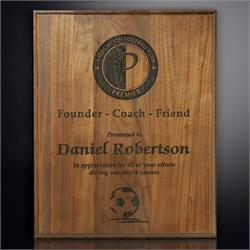 Each award is made of Walnut Natural Finish. 6" X 8"; 1 lbs. 10-1/2" x 13"; 2.5 lbs. 12" x 15"; 3 lbs. Item Size 10-1/2" x 13"
Item Size 12" x 15"